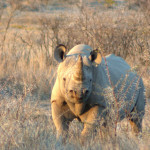 Rhino seen at Etosha View hunting in Namibia. I think I almost got this photo right. Blue wildebeest hunted at Etosha View in Namibia. Best one for the year in 2013. Burchell zebra trophy hunted at Etosha view in Namibia. Some hunting is on current cattle farms, some is on former cattle farms that are now exclusively for game safaris. 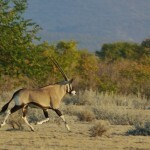 Gemsbok are frequently seen here. 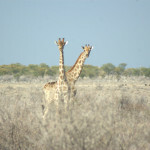 Giraffe see far across the plains near Etosha National Park. 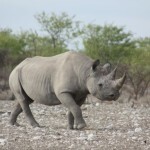 Rhino thrive in the area around Etosha National Park. It is a thrill to be near them. 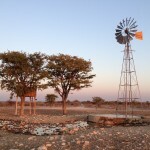 Near Etosha National Park are many farms. Some are now exclusively game safari farms, while a few continue the tradition of cattle farming. Here there is often a chance to come face to face with lion. Lodging in this area is in established lodges.